Using mohair and alpaca fur, local couple has opened an accessory business that strikes a balance between style, sensibility. COSTA MESA — With the sun shining and the temperature at a comfortable 74 degrees, Johnna Rice showed off a plush cream-colored fur scarf around her neck and matching fur cuffs over her wrists and boots. The soft material, made of sheared mohair sewn into a cotton fabric backing, is surprisingly lightweight and cool even in warm weather, she said. And more important, it's animal-friendly, she added. "For those who love the look and feel of real fur, you can love this fur and still feel good about it," Rice said. "No animals are harmed. The animals have to be sheared twice a year anyway, so why not use the fur for something beautiful?" 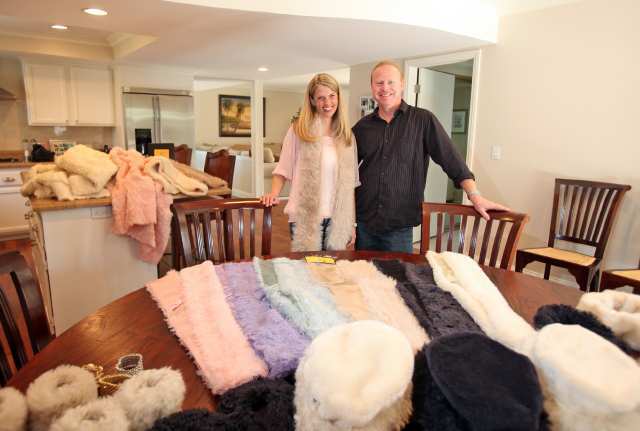 As the demand for high-fashion fur clashes with the growing need for animal-friendly products, Rice and her husband, Jim, a 1988 Costa Mesa High School alumnus, have found their niche in mohair and alpaca fur accessories. The duo recently launched Kul Fur, a mohair and alpaca fur accessories business that specializes in scarves, hats, boot cuffs and wrist cuffs. Having worked with the furs for about 25 years as a supplier to the high-end collectible market — mostly Teddy bears — Johnna Rice always wanted to do something more with the material. She and her husband experimented with turning the lengths of material into scarves and other accessories, hoping that the animal-friendly fur would fulfill the niche that falls somewhere between skinned fur and synthetic fur. "It was a lot of trial and error," Jim Rice said of working with his wife on making the designs and test modeling the first products. "But, we've had a lot of great feedback. People come up to us and ask, 'Oh, is that real fur?' and we explain to them what it is, how it is made and they love it." Once the line and their website, http://www.kulfur.com, gets off the ground, the duo hope to expand into home accessories and upholstery. However, for the time being, the business is the pet project that keeps the couple busy now that their two children have left for college. "Our first project was raising a family together," Johnna Rice said. "Now this is our baby."